Dr. David Livingstone is the renowned British explorer, whom American journalist Henry Morton Stanley greeted with the now famous words, “Dr. Livingstone, I presume.” When New York Herald reporter Stanley found him in a small African village on November 10, 1871, the reclusive Livingstone had lost contact with the outside world for six years. In the late 19th century in Victorian Britain, Livingstone was a popular hero of the era, a celebrated explorer, Christian missionary, staunch abolitionist and pioneering doctor, who developed a treatment for malaria. But was he really the national hero people made him out to be? During his last expedition, Livingstone witnessed and documented an event that changed the course of history. His account of the mass slaughter of the village Nyangwe, recorded in his journal brought back by Stanley, horrified the American and British public and ultimately led to the end of the African slave trade, and closing down the world’s last open slave market. But Livingstone may not have told the entire story of the massacre in his journal. To discover the truth behind the massacre, Secrets of the Dead: The Lost Diary of Dr. Livingstone, premiering Wednesday, March 26 at 10 p.m. ET on PBS (check local listings), follows a team of experts, led by Adrian Wisnicki of Nebraska University, as they attempt to decipher Livingstone’s original field diary – recently discovered – to determine what really happened in Nyangwe. In researching the massacre, Wisnicki uncovers several accounts which curiously are all different. These varied accounts, alongside Livingstone’s published report and the writings in his journal, suggest he was a far different man than the legend that surrounds him. To find out the truth about Nyangwe and Livingstone, Wisnicki sets out to locate the field diary that corresponds to the massacre. 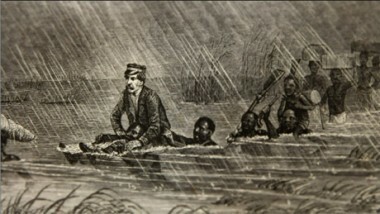 Among the Livingstone family possessions, locked away in the store room of the David Livingstone Centre near Glasgow, Wisnicki comes across the original field diary – Livingstone’s private diary – containing his first-hand account of the massacre. Scribbled on tattered pieces of newspaper, Livingstone kept the diary with him never intending for anyone to see. Embarking on a scientific collaboration that would last for six months, Wisnicki employs state-of-the art multi spectral imaging technology, first invented by NASA, and cutting edge equipment that can see what to the naked eye would be invisible to recover Livingstone’s faded diary entries. Why was the diary scrawled on The Standard newspaper in berry juice and not on writing paper in ink? How did Livingstone’s obsession with discovering the source of the Nile cause him to stray from his principles? How did the death of his wife affect him? Livingstone wrote about the massacre in earlier reports, but what really transpired? What was Livingstone covering up? For the first time in 140 years, the secrets Livingstone tried to keep hidden are revealed. Secrets of the Dead The Lost Diary of Dr. Livingstone is a Sky Vision Production for THIRTEEN Productions LLC in association with WNET and National Geographic International. Director/writer is Melisa Akdogan. Executive producers for Sky Vision are Tom Adams and Danny Tipping. Executive in charge for WNET is Stephen Segaller. Executive producer for WNET is Steve Burns. Coordinating producer for WNET is Stephanie Carter.